Offer is only applicable to users who are transacting via PayPal, for the first 3 times. This is valid for burgers, pizzas, wraps, desserts. Hurry! Offer is applicable on first two transactions using LazyPay on App/Web. Cashback will be credited to your LazyPay account within 24 hours. If getting set breakfast, lunch, and dinner is a problem for you then here is the food store that will solve that problem. Try FreshMenu, a food ordering service that will provide you with tasty food every day. They stand by their aim to provide the best food to the customers every single time of the day, be it breakfast, lunch or dinner. With fresh ingredients, expert chef-cooked meals, mouthwatering recipes, and on-time delivery, you can rest assured you’ll have a gastronomic experience worth remembering. So, the next time you feel the hunger pangs, don’t forget to try out this multi-cuisine food ordering service. Every year, season or offseason we observe that there is a lot of food and we also see people’s love for food! There a lot of parties, either you are giving one or you are being invited to one. There is food and there is delicious food while we are at it. If you have seen what Freshmenu has to offer, you would love it a little bit more. If you aren’t looking for the traditional food that you get and want to soothe your cravings with the best of the cuisines. If you are craving for cheesy pizzas after a long day of tiresome work, You can order one using the special Freshmenu food coupons. If you have a sweet tooth, then order yourself your favorite from the Meetha collection. You can even get a Lava Cake in a Jar if you wish. Other than there a lot of pastries to choose from as well. If you are planning to get on a healthy diet, they have you covered there as well, they have salads and steaks to offer. If nothing else you can just order trail mix. Not just that, there is a lot more that Freshmenu can offer you in terms of special food offers. So the next time you are wondering what to break your hunger besides just normal food, fruits, and water, you know what to order and from where as well. When They Say Multi-Cuisine, They Mean It! FreshMenu not only provides different menu every day and every week but also serves different cuisines. Italian, English, Chinese, Continental, Portuguese, Indian, you name it, they have something or the other in store for you. They have one of the best food spreads you can find in any online food ordering portal. Try out their juicy burgers, and sample their yummy pasta, the oh so delicious English breakfast platter, sumptuous steak with rice, crunchy, fresh salads and much more from an exquisite menu. You must be thinking if it’s so fancy, it wouldn’t go easy on your wallet. But here’s where you’re wrong. All of the aforementioned items, you will get at the most economical rates possible! Now you can have a proper, tasty meal at the best price with FreshMenu. Your City, Your Menu, Your Choice! Freshmenu offers you the best cuisine to choose from. They provide some of the best options when it comes to online food ordering across multiple cities. Freshmenu Mumbai offers you the best Asian cuisines while your thirst for continental food can be quenched through Freshmenu Delhi. All your late night snacks are sorted with Freshmenu Gurgaon. Rush to Fresh menu Bangalore for authentic Italian delicacies. Wait a minute! Did you just assume that FreshMenu has cuisines exclusive to different cities? Well, here’s a secret about FreshMenu then - every cuisine in every city is just as authentic. Be it Fresh menu Mumbai and the local delicacies and pan Indian dishes or the spicy chats available in the Fresh Menu Delhi inventory, you can purchase from a wide selection. The IT hubs provide some of the most finger-licking treats viz. Fresh menu Gurgaon- whether it is Italian, Continental or Asian. Don’t worry about the location; you can be in a park and they will deliver your order there too. No kidding! You can find the dish you want and place your order using the different filters like cuisine (whether it is veg, non-veg that you prefer), price, courses (starters, main course, desserts), sweets & savories, appetizers, and side-dishes, etc. So, go ahead and set up an account on FreshMenu and order healthy food every day, without getting your pocket pinched. Never face the trouble of ordering stale food as Freshmenu guarantees you the freshest food available. With chefs blessed by Zeus himself, you can trust them for cooking up a storm! Don’t ever compromise on food orders again. What Does The Spread Actually Look Like? All Day Breakfast - From the cheesiest frittatas to the healthiest seasonal fruit bowls, there’s everything required to make a complete breakfast. Need to satiate that sweet tooth? How about some fruit cake or fruit parfait?! Pick from a healthy mix of nuts and muesli for a robust start to your day. Mains and Sides - Melt in the mouth koftas, spicy rice bowls, sumptuous burgers, creamy pasta, deliciously layered lasagnas, soft noodles, crispy fish fingers & garlic bread and much more, enjoy variety like no other with FreshMenu mains and sides. Pizzas - Choose from a unique range of veg and non-veg pizzas that are made with fresh vegetables and meat, guaranteed to leave you asking for more! Soups and Salads - Pick from the delectable selection of salads made from seasonal and regular vegetables, topped with intricate dressings. Dumpling soups and chicken clear soups with lemon and coriander are must tries. Quick Bites - Be it sandwiches, wraps or canned & bottled juices, these quick bites will brighten up the rest of your day and keep you revitalized. Desserts - From soft, chocolate-laden gooey brownies to sandwich cookies, cakes in a jar and strawberry mousses, FreshMenu has got everything that your sweet tooth needs and deserves. So, this is what the spread looks like. Ready to order yet? Is that a grumble in your tummy? It is understandable that getting fresh menu every day can be a task. Don’t miss the sweet aroma of good food anymore! FreshMenu is here to take care of all your taste buds, every day. Get the best food only on Fresh menu- Bangalore or Noida. But wait, what’s up with all the fresh menu offer you keep hearing about? Well, get the latest and best freshmenu offers right here on GrabOn. Avail amazing freshmenu coupons and freshmenu promo codes and save big every time you order food online. Finding a coupon for freshmenu just got easier, right? 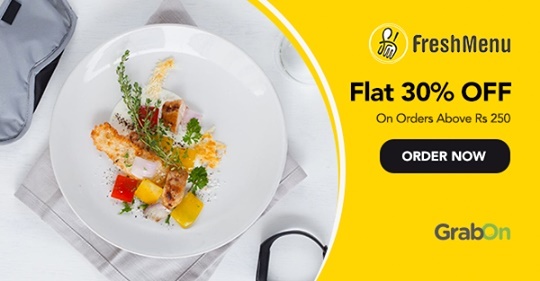 GrabOn helps you select a wide range of freshmenu offer across all cuisines and dishes. So, if you are ordering from FreshMenu ever again, you don’t have to google fresh menu coupons anymore. Just visit GrabOn and type in freshmenu coupon and find the code that you were looking for. Don’t break your head over finding the best fresh menu coupons; find them all at once place and relax. Order your favorite meal and enjoy the goodness delivered right to your doorstep. It is obvious that FreshMenu will give you the best dishes at lowest rates possible but what if you can save on that as well? Sound amazing? Use GrabOn and get all the best and latest Fresh Menu coupons that can help you save more on every meal you order! How to get best deals using our freshmenu promo codes? Go to GrabOn.in type in Freshmenu in the search bar and press enter. Copy the Code and visit Freshmenu website. Select your choice of meals, desserts, burgers, snacks, apply the discount code at the checkout page while placing the order. If you want to reach FreshMenu on their customer support helpline, you can always call them on: 080-4042-4242. Work life can be hectic and you hardly get any time to make yourself a good meal. Being able to order food online has made lives easier but eating outside every day takes a toll on the body. It might not be a good option for a long run. So if you are caught with your busy work schedule but still want to have fresh healthy food, FreshMenu has answered your calling. You can order fresh food online anytime and get it delivered within half an hour to your place. FreshMenu offers you with the freshest assortment of dishes each day, all made with only fresh ingredients. FreshMenu refreshes their menu every day, with a new set of a menu designed for each day and scrumptious meal to satisfy your taste buds, what more could you possibly ask for. Well, yes, you actually could for the freshmenu discount coupons. You can use these coupons for freshmenu meals. FreshMenu makes it mandatory to deliver only good food to their customers. And it’s not just good food that you get, FreshMenu ensures your meal leaves you with a good burp. You can download their mobile app and order what you like from anywhere in the city. Get a freshly made meal delivered in just a short time. Get the FreshMenu coupons before they disappear from this page. Look out for latest offers from the FreshMenu.com in this GrabOn page. So if wanting to have a good food experience is on your list, then get those FreshMenu online food coupons today and order away.